The CT963 is an excellent choice for a 1U rack-mount network emulator supporting speeds up to 990Mbps (bi-directional) or 1Gbps when traffic load is not maxed out in both directions. The CT963 fits into a standard rack and is 14 inches deep. It supports standard VGA, Keyboard, and Mouse interfaces for easy console/desktop access to the system. The CT963 is relatively noisy, so it is better for a data center deployment than a desktop environment. The CT963 hardware can support up to 3 WAN emulations with aggregate bandwidth of about 1.6Gbps bi-directional. Contact your sales representative if you prefer more than a single WAN emulation. No additional hardware or software is required, but you may wish to manage the system using the LANforge-GUI on a separate machine. The CT963 should now boot. If DHCP is enabled on the Management network, the CT963 will automatically acquire an IP address. 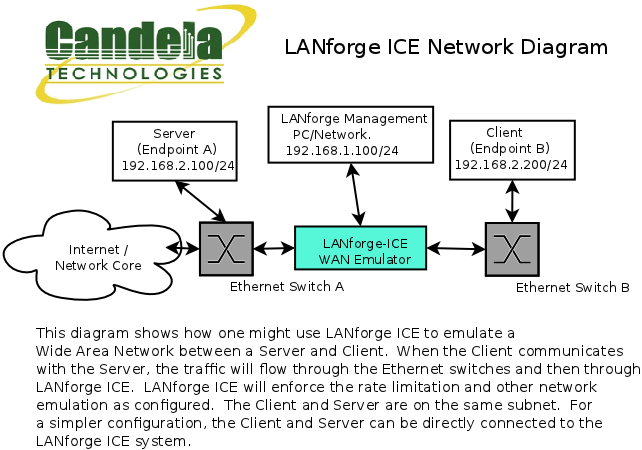 If DHCP is not available, the IP address will be set to 192.168.1.101 by the LANforge scripts. Start the LANforge-GUI on the management PC, or the CT963 server if managing locally, and click the 'Discover' button. It should find the CT963 appliance and add the IP address to the drop-down box in the Connect widget. Press 'Connect' and you will be connected to the CT963. Gigabit-class Intel Multi-Core 1U rackmount server. 2 GB or more RAM.